My next book, Tony Wheeler’s Islands of Australia, is coming from the National Library in Canberra in October. Working on this title has certainly extended my knowledge about Australia’s 8222 islands and I’ve managed to visit quite a few more of them. I’ve reported recently on my travels around the islands of Western Australia: Dirk Hartog, the Houtman Abrolhos Islands, Middle Island and the islands of the Recherche Archipelago and popular Rottnest Island. And my visit to Erith Island and the islands of Bass Strait. 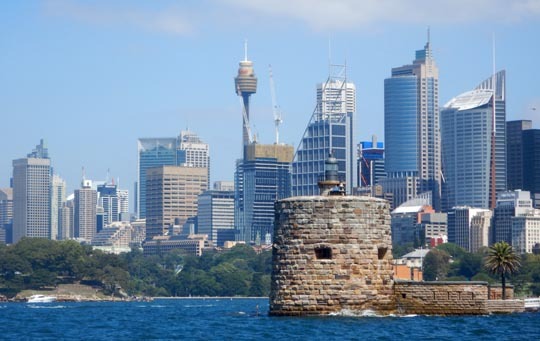 ◄ This time it was Sydney Harbour which has quite a collection of small islands including Shark Island, a popular little picnic retreat reached by ferries operated by Captain Cook Cruises from Circular Quay in the centre of Sydney. 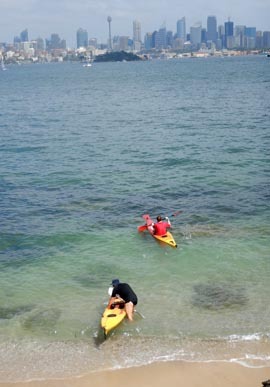 And by kayakers, like this pair launching off from an island beach with the Sydney skyline in the background. The island’s name comes, it is said, from its shark-like profile. Or perhaps from an 1877 encounter between a shark and the country’s star Australian Rules Football player George Coulthard who was sitting on a boat off the island when his trailing coat tails were grabbed by a large shark and he was hauled into the water. Disentangling himself from the shark’s jaws, he vaulted back onboard in a ‘kind of somersault’ arriving to safety ‘just about as quickly as he had been taken overboard’. 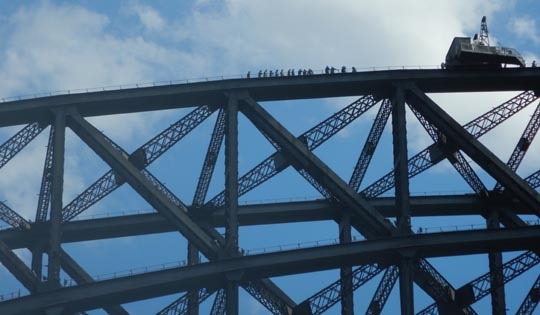 ▲ The fact that you can see the Opera House and the Harbour Bridge from the island emphasizes how close it is to the city. ▲ Yet it’s still green and tree-covered, a stark contrast to some other islands in the harbour. ▲ Like Fort Denison or Pinchgut Island which once upon a time probably looked much like Shark Island. Using it as a quarry pretty much chipped the island away soon after the First Fleet arrived from England. Then it became a bread & water punishment prison, hence the pinchgut name, and was used for executions before it became a fort sporting the very last of 189 Martello Towers, most of which are in the Mediterranean. In contrast to its Pinchgut name there’s a rather nice restaurant with fine harbour views on the island today. Regular harbour ferries run out to Fort Denison. ▲ to Cockatoo Island which was also extensively developed to become a prison, the ‘gentleman bushranger’ Captain Thunderbolt was said to have swum to freedom from the island in 1863. Then it was redeveloped as a shipbuilding works which continued operating until 1991. It was extremely busy during WW II, patching up and repairing Australian and US navy ships damaged during the Pacific War. Today it hosts an annual arts festival, features a popular campsite and is a good lookout point for Sydney’s New Year’s Eve fireworks display. Any time of year it’s an interesting island to wander around, inspecting the now empty shipbuilding workshops and docks.